Audio Source: audience > Lineage: Pro video > VHS > audio is extracted from that videotape. If there is one artist who deserves to be described as a trailblazer and mythic figure of rock and pop, it’s definitely David Bowie. Like a chameleon, throughout his career he has never stopped reinventing himself and exploring new horizons. 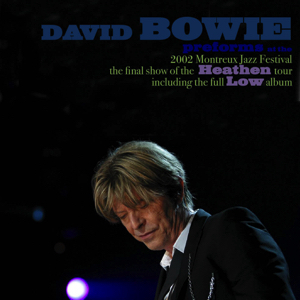 In his new work Heathen, he joins up again with his favourite producer Tony Visconti.
. A generous David Bowie at the Montreux Jazz Festival. David Bowie ended the European leg of the ‘Heathen’ tour last night in the Stravinski Hall at the Montreux Jazz Festival, in Montreux, Switzerland. Despite sweltering temperatures, David performed a longer than usual set by rewarding the audience with a similar one to that which he performed in Cologne last week. He started the show in the very stylish black and white clobber that has become the trademark look of this tour. BowieNet’s resident mathematician has predicted that we can expect a similar look for David around the year 2012, if the pattern of 1976, 1990, 2002 is to be continued. The fans down the front didn’t disappoint in terms of launching appropriate items stage-ward at the appropriate lyrical prompts…such as “Just wishing that I had just something you wore”, “I’d love to get a letter” and possibly “…your big fat dog” and perhaps even “…the girl next door”! At the end of the show, in a rather surreal scene, some important type (Claude Nobs, the founder of the festival, apparently) presented DB with a huge Swiss cowbell onstage…by all accounts David was almost overcome with laughter as he struggled offstage banging his gift. Remembering his antics with various items during ‘Cactus’ on this tour, I’m not quite sure how I should interpret the verb “banging”? Whatever, that’s a picture I would love to see.